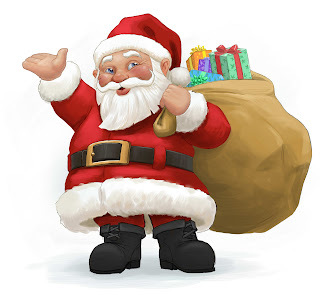 I was just introduced to a brand new website Santa.com. It is a really fun site to check out. The kids can write a letter to Santa, create an online wish list, get a personalized letter from Santa, parents and grandparents can shop or purchase a gift card, and more. The letters to Santa are an interactive project that the kids will love. The child can choose from a variety of adorable backgrounds, type or dictate the letter to Santa, and then press send! The folks at Santa.com generously gave me a voucher for a free letter from Santa. You are allowed to personalize the letter any way you like. I had a great time writing the letter to all of the ten cousins who will be together on Christmas Eve. I mentioned all of their names and something personal about each one. I look forward to this really fun surprise for my grandchildren on Christmas eve. You can check out the letter from Santa options here. 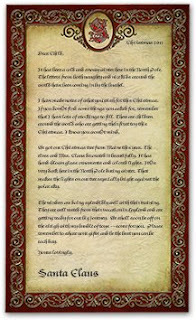 If you are interested in getting a personalized letter sent from Santa the order must be submitted by December 5, 2011. For a chance to win a voucher for a free letter from Santa leave a comment on this post. The winner will be randomly chosen on Sunday, December 4. Make sure I have a way to reach you. Remember, the order must be placed by December 5th. What a cute site! Thanks for sharing. Ho Ho Ho! Merry Christmas! What an incredible idea. Fingers crossed that I win. My kids would be smitten. This is a wonderful site! I have a child that is soon to the age of non-believing, & an official letter from Santa might just be the thing that helps her believe a bit longer!